The last time you heard of iodine, it was probably in a grade school experiment and you were using it to turn potatoes purple. What you might not have realised at the time was just how important iodine is to your health and nutrition. A relatively rare element due to its high atomic weight, iodine is found in greatest concentrations in the ocean and in brine pools, but rarely further inland. Because of this, until iodine and its nutritional properties were discovered in the 19th century, iodine deficiencies were common throughout much of the world. In fact, there were a number of “goiter belts” throughout various countries, including the United States and Canada, in which there was a high incidence of enlarged thyroid gland, or “goiterism” â€” invariably due to poor availability of dietary iodine. Fortunately, those days are now over. Iodine-Pro™ ionic iodine is the easiest way to make sure you’re getting the correct amount of iodine in your diet. 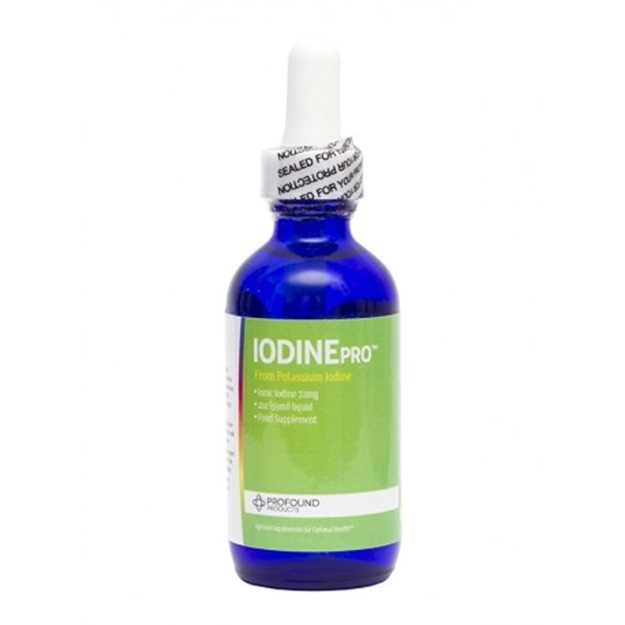 Formulated in a liquid ionic solution so it’s easy for your body to absorb, Iodine-Pro™ also has a metered dropper, so unlike with tablets, pills, and iodised salt, you always get the right dose. Iodine-Pro™ is non-GMO, allergen and gluten free, and vegan friendly so it won’t have any unpleasant side effects, and it’s blended with 72 trace minerals and elements to fill in any gaps in your nutritional regime. Iodine is an essential trace mineral, which although relatively rare on earth, is required in some amount by many higher order mammals including humans. Though historically known for its capacity to treat goiterism, iodine has been neglected in much modern nutritional literature under the assumption that iodised salt was capable of fulfilling most normal requirements. Unfortunately, health scares about salt and its effect on blood pressure have caused many Americans to dramatically cut the amount of salt in their diet. While this is potentially beneficial for cardiac health outcomes, it may also be severely limiting the amount of iodine in many people’s diets. This problem is further compounded when the actual levels of iodine within iodised salt is considered. A number of tests on commercial products have found varying levels of iodine within products, often far less than is stated on the label. Even more alarming is that processed foods, despite abnormally high salt levels, contain no iodine at all. What this means is that even for those of us who try, getting enough iodine in our diets can be an immense challenge. That’s why rich sources of dietary iodine are in such high demand by many nutritionists, medical professionals and discerning health supplement users. Why do I need iodine in my diet? Iodine’s major function within the body is to regulate the thyroid gland, a butterfly-shaped organ in the neck that creates hormones which are then sent throughout the body. These hormones help our bodies control metabolism; stay warm; ensure normal function of the brain, heart, and other organs; it assists in proper absorption of other minerals such as calcium and selenium. Because thyroid hormones are involved in so many processes within the body, any disruption of iodine supply can have a dramatic effect on the body. Sufficient iodine intake is particularly crucial during pregnancy and breastfeeding to support growth and development in children. What happens if I don’t get enough iodine? Unsurprisingly, because of the thyroid’s importance to metabolism, growth, and development, there is a wide range of negative health impacts associated with deficiency. Perhaps the best known is goiterism, which manifests in a swollen, unsightly and painful thyroid gland. Severe iodine deficiency in pregnant women can cause irreversible damage to the fetus including stunted growth, mental disability and sexual dysfunction. Less severe iodine deficiencies are capable of causing lower-than-average IQ in infants and children, and can also decrease ability to work well and think clearly in adults. Iodine deficiency is more common than you might expect. A World Health Organization study in 2007 found that nearly 2 billion individuals suffered from an iodine deficiency, a third of who were of school age, making iodine deficiency the leading cause of preventable intellectual disability. If you fall into one or more of these risk groups, or if you suffer from some of the symptoms listed above, you may well have an iodine deficiency and you would be well advised to seek sources of dietary iodine, such as Iodine-Pro™, in consultation with your health professional. Other Ingredients: Purified water, potassium benzoate, potassium sorbate, citric acid.